Director General Inter Services Public Relations (ISPR) Major General Asif Ghafoor on Monday assured locals in North Waziristan that the shops destroyed during Operation Zarb-e-Azb will be handed over to their rightful owners soon. Journalists and anchorpersons from national and in­ternational media visited Miran Shah and Ghulam Khan Border Terminal on Sunday along with DG ISPR and interacted with local people. The DG ISPR had a face-to-face con­versation with locals regarding their issues during the visit. Some of the locals stated that their shops which were destroyed in the operation were to be reconstructed and handed to them but were being allotted to oth­ers through a fake database. 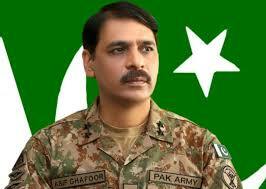 DG ISPR, however, assured the locals, you will have the shops before my next visit. When locals said that it should be ensured that a fake database is not re­leased, Major General Ghafoor asked whether there had been progress on the matter from the first time they had visited Islamabad. The locals agreed that there had been progress but raised concerns that reports are emerging regarding a fake database. DG ISPR responded, this is why you, the local administration and owners have been included and lists will be scrutinised to make sure that those who have made fake claims are not given the stores and only rightful owners are. Meantime, a song prepared by ISPR soon after the terrorist attack on Army Public School Peshawar has echoed in India on Indian Republic Day. Children of a school in India played and performed on the song, released by media wing of Pakistan’s armed forces few years back, on Indian Republic Day. A video of the song has been doing rounds on so­cial media in which you can see a big school of the rival country has organised an event to observe their national day and the schoolgirls are performing on the Pakistani song.